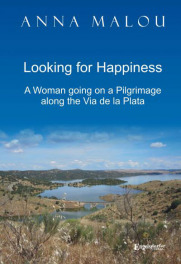 Anna Malou reports about her wandering quite alone along the Via de la Plata from Sevilla, in the South of Spain, to Santiago de Compostela, in the North of Spain. She informs us about her one thousand kilometres tour through lonesome national parks, old Roman towns, mountains and reservoirs, always surrounded by a large variety of wild growing flowers, grassland, cork trees and wine yards. Such an extraordinary nature brings the spectator into a state of astonishment and dreaming. In addition to that she describes her meeting with numerous pilgrims; that can lead to a continuous meeting or even a deep friendship. The choice of subjects reaches from the life in pilgrim hostels to the contact with the Spanish population, living in small villages and hamlets. Feeling the loneliness of the long-distance walker and the lack of surplus, you are able to find a way to your inner self. Heart and soul of the female pilgrim are deeply filled with a religious, mystic and spiritual sentiment, which is coming to a highlight, when she arrives at her destination: Santiago de Compostela. On the one hand the fantastic vision tour leads to a physical exhaustion, but on the other hand it is the moment when the soul touches the happiness of freedom.